Gulden Draak 9000 Quad is a quadruple that is well-balanced while possessing out of this world flavors. There is a decent amount of alcoholic born that immediately greets imbibers before hints of vanilla and sugar can be discerned. While the beer pours with a substantial amount of head, the foam gradually dissipates until there is a small amount of off-white lacing that sits on top of the Gulden Draak 9000 Quadruple. The high ABV of this quad means that the constituent flavors exhibited in the beer remain constant from beginning to end; as the effort reaches room temperature a bit of the alcohol intensity begins to subside to allow tastes of fig, raisin, and plums to shine. This quad is more of a sipping experience and would best be enjoyed in a position where one can experience rather than the busy hustle and bustle of a community gathering, bar, or restaurant. The flavors are bold without being brash, tied together with a sweet thread that is inviting. This sweetness makes Gulden Draak 9000 Quad deceptively dangerous. Check out our previous review of the dark triple by Gulden Draak; both beers represent the gold standard in terms of Belgian beers, providing a substantial alcohol bite that pushes the presented flavors into an entirely new plateau of complexity. Gulden Draak 9000 is available in 11.2 ounce and 750 mL bottles and would be paired well with strong cheeses, lamb, beef roasts, and wild pork. 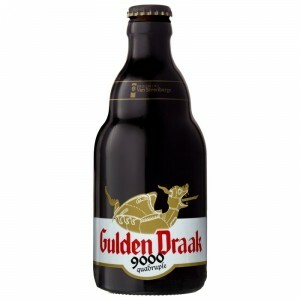 Gulden Draak 9000 Quad is available in the United States courtesy of the Global Beer Network. For a full list of the beers that the company imports, visit their website at www.globalbeer.com/ .